You can’t beat that crystal sound that you can only get form a vintage microphone! Vintage crystal through and through, old stock, boxed and as tidy as they come. 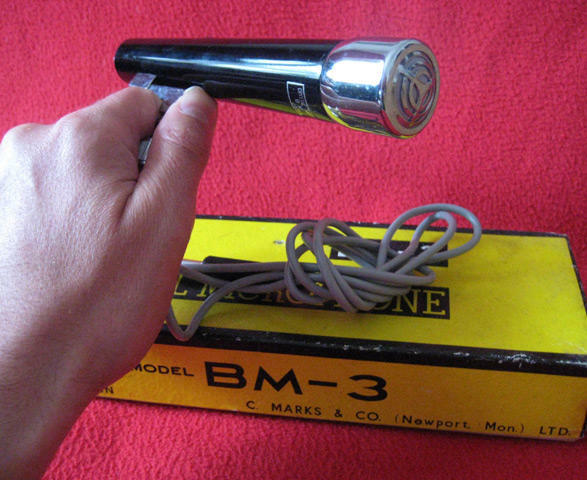 These mics in the 60’s were branded through a number of firms but were all the same, some called the BM-3 and some B1201. Comes supplied with it's own lead ready to plug and play staright into your harmonica amplifier. This is a great example with a lovely bright sound. A true blues harmonica microphone. As the mic has a small head it is easier to cup than JT-30 bullet shaped microphones for some with smaller hands and makes it easier to wail open notes with some hand opening to vary your tone. Killer vintage look with the old style grill like the front of a vintage cadillac , killer crystal sound, killer price, making it a great vintage harmonica microphone to buy! All round great condition, there are no scratches on the body but there are a few marks, nothing to worry about however. Comes complete with box and original neck hanger should you ever choose to use it that way. Cool as they come for a vintage mic from the 60's. Check your 'Cart' once item(s) are added to see shipping cost which are based on weight and destination. Copyright © 2012 - 2017 Honkin' Harmonica Shop | All Rights Reserved.